Jared Kushner, advisor to and son-in-law of US president Donald Trump, is facing growing scrutiny over possible collusion with Russia during Trump’s election campaign. Some in Trump’s legal team had even suggested that Kushner step down (paywall). But China, it seems, is still confident of Kushner’s position in the White House. China is one of the many challenging issues in Kushner’s exceptionally broad portfolio in the White House. 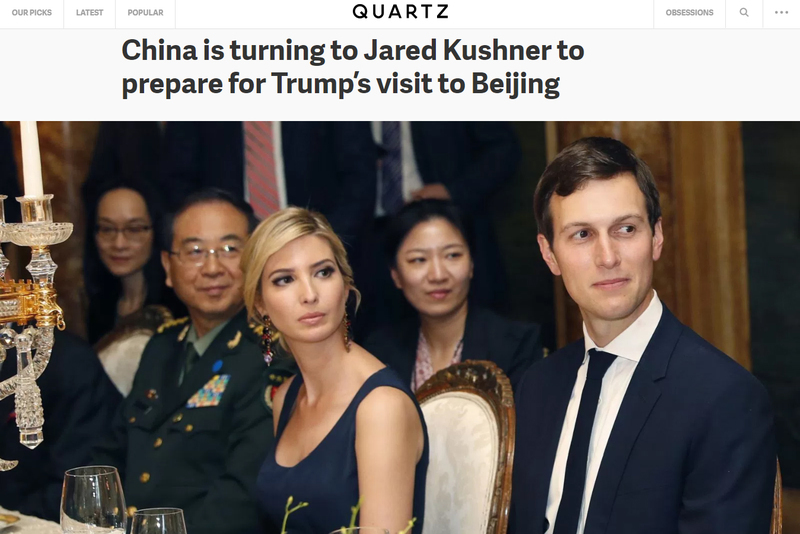 He is reported to be the chief broker of Trump and Chinese president Xi Jinping’s first meeting at Mar-a-Lago in April, during which Kushner rolled out his kids to recite ancient Chinese texts for Xi. North Korea and trade issues are expected to be at the top of the agenda at the next Xi-Trump meeting, likely to take place in November.